As the day's final bell rings, less than 24 hours before one of the most important games of the season, the Margaret Long Wisdom High School varsity boys soccer team gathers outside the gym. Despite the sunny April afternoon, today's practice will take place indoors. That's because Wisdom doesn't have a soccer field—the varsity soccer team practices inside the school's wooden-floored basketball gym with rickety bleachers unfolded on each sideline and fluorescent lights beaming down from the ceiling. But that doesn't dampen the students' excitement. A handful of varsity players are still dressed in their school uniforms, khakis and collared shirts, while others have already changed into mismatched athletic gear—faded undershirts and T-shirts that read "Tecate" and "Fiesta," hand-me-down Adidas shorts and running shoes with holes on the bottom. Fidel Andrade, the head coach of the varsity squad, sets up orange cones as goal markers alongside each baseline as his team—some seated in the bleachers, others standing courtside—awaits his instruction. "Let's warm up!" the 35-year-old Andrade, dressed in a black polo shirt and tight, off-white, distressed jeans, calls out. The team captains lead everyone through stretches before running sprints inside the cafeteria and hallways. One of the team's offensive stars, however, isn't here. Seven weeks ago, in a meeting with Andrade, Angel Hernandez (not his real last name) told his coach that he had to quit the team because of immigration issues. His departure was a huge blow: Hernandez was one of the team's leading scorers ("Last year was a breakout year—he was just huge for us," Andrade says). During practice, his presence is still felt—even without his double-footed, quick passes, his distinguished dark black hair or the tattoo of the date of his grandmother's death etched on his inner left wrist, visible whenever he waved his arm. Now, working a full-time job, Hernandez texts a few of his former teammates for updates after games. Following the warm-up, the players run through the drills, speaking to each other in Spanish and English, switching between the two languages. Eduardo Salgado, a muscular 19-year-old forward from Honduras, lines up alongside Biganiro Espoir, a gangly 18-year-old midfielder from the Democratic Republic of Congo. Espoir jokes around and dances as his teammates laugh at his antics. "Soccer is fun," Espoir says with a big, toothy grin: "And I really like to have fun." "Get into position!" Cesar Montelongo, an intense, 5'8" forward with chiseled cheekbones and jet-black hair, yells at his teammates on the far side of the gym. Andrade waits, then kicks the ball into play. Wisdom's year has been memorable. For the last several months, the team executed a run that, given the players' individual circumstances off the field—including several team members being displaced from their homes by Hurricane Harvey—sounds improbable. The Generals amassed an impressive 20-2-2 regular-season record and became the only team from the Houston Independent School District—the country's seventh-largest district—to reach the UIL State Championship Tournament in boys soccer. The 28-man roster is made up of immigrants from 13 countries and four continents. Most of the players work one or two jobs to help support their families; team members have had to quit midseason after becoming fathers. And almost every year, the team loses a player or two to deportation, a reality that has worsened this year as the Trump administration has ramped up its immigration policies. More Wisdom players are in jeopardy than ever. "I'm used to it, but you still feel so bad," Andrade says. The first blow to Wisdom's season came last summer. When Hernandez, a rising junior, was pulled over while driving a friend's car, the police officers called Immigration and Customs Enforcement. Hernandez, who is undocumented, had immigrated to Houston from El Salvador when he was 14. After he appeared in court, officials held him in county jail during the first six months of the school year. When Hernandez was released in January, he learned that he would need to attend a series of additional court dates scheduled throughout the semester to fight to stay in the U.S. His younger brother, who he immigrated with, had already fled Texas to avoid immigration officials. To pay for his lawyer, Hernandez found a full-time job driving a delivery van, forcing him to quit high school a few courses shy of his diploma—and to leave his beloved soccer team. The team was still incredibly talented. Just how talented—without Hernandez—Wisdom would need to find out. The team got its first glimpse of where it stood at a preseason tournament, losing two games and ending the third in a tie. Andrade, who has a tactical coaching style, says that the early games are where he likes to test different roster combinations, gauge the chemistry of his players and observe their skill sets. "That whole tournament, I told the players, 'This isn't bad. Don't worry; we are just seeing what works and what doesn't work,'" Andrade says. The Generals got their footing once the season started. They won their first and second matches, and before long they had racked up 20 straight victories. They didn't lose again until the postseason. "We knew how to win games and just take the game at its pace," Andrade says. The momentum continued into the state playoffs, when Wisdom defeated Shadow Creek, 4-1. The Generals followed that win with another 4-1 victory against Caney Creek High School. In the third round, Wisdom faced Galena Park High School, "an amazing team loaded with talent," Andrade says. The Generals won in overtime, 3-1. In the Region 3 semifinals, Wisdom faced Texas A&M Consolidated High School, a tactical team with a lot of depth. "We never felt like we lost control," Andrade says. Wisdom won, 2-0, moving on to the Region 3 Final to face Huntsville. 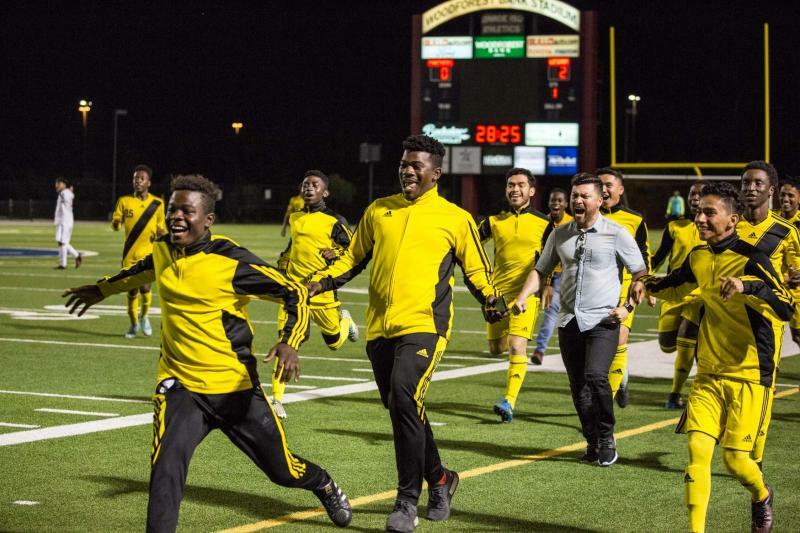 That Wisdom—a team without any club players or the financial backing that so many elite Texas high school teams have—could band together and thrive is a testament to Andrade, who is, himself, an immigrant. To his players, Andrade is more than a coach; he can relate to what they're going through. Andrade's mother fled El Salvador for the U.S. to escape the country's civil war shortly after giving birth to him. He and his three siblings were left to be raised by her parents in a 300-square-foot shack; each sibling slept on a thin mat, stacked in pairs, bunk-bed style while violence surrounded them. "You could hear the explosions," Andrade remembered. "When you heard the bullets, we'd all lie flat on the floor for hours, waiting for it to stop." Andrade's journey to the U.S. was harrowing. When he crossed the Guatemalan border into Mexico, he was forced to wait several months for transport across the U.S. border because the "coyotes"—smugglers who are paid to bring immigrants across the border—kept bypassing him and his siblings. Finally, after Andrade's mother threatened to report the coyote, Andrade and his two sisters were sneaked across a dark, deep river. Immigration officials found them on U.S. soil and took Andrade and his siblings to a hotel. There, hours later, he met his mother for the first time. She pleaded with officials, telling them how her family had fled civil war and needed asylum in the U.S. They settled first in New York and then in Houston with other relatives, 12 family members living in a one-bedroom house. Soccer was a means of escape for Andrade. During his tenure at Wisdom, the school—formerly known as Robert E. Lee High School—was undergoing a demographic transformation of sorts. An influx of Asian, African, Mexican and Central American immigrants had populated the region; between 2000 and 2013, the Houston metropolitan area's immigrant population grew at nearly twice the national rate, and Wisdom's student population was changing as a result. (Today, 60 percent of Wisdom students are English language learners, and 200 of those students are first-year immigrants to the U.S. The student body is made up of pupils from more than 60 countries who speak some 40 different languages—"our own United Nations," Wisdom High School Principal Jonathan Trinh, an immigrant from Vietnam, says.) The school's motto, painted on a wall near the entrance, reads: "Where the World Comes to Learn." Andrade graduated from Wisdom in 2002 and enlisted in the Army as a combat soldier. (He had become a father at 15, which meant forgoing college soccer scholarship dreams.) "My first tour was a year and seven months," Andrade says. "I came home, and I told myself, If I survive, one of my dreams is to come back to my old high school and teach and coach, to make a difference." That meant coaching a number of student-footballers, many of whom had fled war-torn corners of the world. Andrade recalled that one of the best players he ever coached had escaped Eritrea, after having been captured and taken to a prison camp and forced to work for guerillas. "We try to always let them know: If you're here, you're blessed—we can find a way," Andrade says. Many of Andrade's current students have similar stories: Espoir and his family fled the Congo due to the country's escalating war violence—soldiers had burned his house to the ground only a few days before their departure—and found soccer shortly after arriving in the U.S. Salgado's mother forced him to leave his native Honduras because of escalating drug and gang violence. When he arrived in Houston, alone, the pitch was the one place he felt at ease. "Soccer helps me…the personal issues that I have, I forget about those when I am playing," Salgado says. The Generals celebrate on the sidelines. Photo by Jill Hunter. On April 14, close to 100 Wisdom fans drove an hour northeast of downtown, to the suburb of Humble, for the Region 3 Final against Huntsville High School. Wisdom's drum line arrived, setting up on the baseline near its cheerleaders, dance squad and flag team. Huntsville scored first and held the lead heading into the second 40-minute half. With 21 minutes to play, Andrade called his team to the sideline. "This is your time to give it all you got," Andrade says. "We are the better team, and we are supposed to win this game." Because his players understand varying levels of English, Andrade designs plays with code names. Each play is a basic color, a number or a combination thereof. "Why say, ‘Go through the middle!' or ‘Take a shot!' when I can use colors?" Andrade would say later. "Even if they don't speak our language, they know basic colors, so they know what the play means. And the other team doesn't." Less than five minutes later, Wisdom's Lemembe Kamengele, an immigrant from Mozambique, fired a shot toward the goal; a Huntsville defender deflected the ball back into a scrum of players, where Montelongo bobbled it and passed quickly to Salgado, who fired a shot into the corner of the goal. The Wisdom crowd cheered, jumping up from their bleacher seats. Salgado raised his finger and pointed to the sky, hugging teammates before running toward the bleachers. Salgado's uncle stood on the bottom bleacher, leaning over the railing and holding out a cellphone. He'd been filming the game on Facebook Live, so Salgado's mother, in Honduras, could watch. She hadn't seen her son in five years, and she had never been to one of his soccer games. Salgado grinned into the phone's screen, waving, before running to the sidelines to hug Andrade. "This goal is for you," Salgado said, embracing his coach. Five minutes later, with seven minutes left to play, Wisdom's Francois Elize directed a throw-in toward a group of players. Espoir jumped high into the air and sent a long-range header glancing off a Huntsville defender and into the net. The Wisdom players erupted in cheers, raising their arms and hugging one another: Wisdom 2, Huntsville, 1. Wisdom staved off Huntsville's scoring attempts as the clock wound down. When the final whistle blew, Espoir grabbed a Congolese flag and draped it around his and a teammate's shoulders as they walked toward the middle of the field to shake hands with their opponents. Wisdom, Region 3 champions, had advanced to the state semifinals for only the second time in school history. On April 19, Wisdom faced Aledo in the 5A State Semifinal game. Aledo, a Texas high school football powerhouse that's won six state titles in the last eight seasons on the gridiron, was undefeated—the Bearcats had posted a 24-0-4 record on the pitch during the regular season. As the teams warmed up, music played from the stadium loudspeakers inside Birkelbach Field in Georgetown, Texas. "I just wanna Rolly Rolly Rolly with a dab of ranch," crooned Ayo & Teo on their hit song, "Rolex." On its sideline, Wisdom gathered before taking the field. "Who are we?" Andrade yelled. "Lee!" the players cried out in unison. From the outset, Wisdom, dressed in yellow and black, looked determined. The Generals maintained strong possession of the ball in the early minutes and seemed to be communicating well. "One thing about Houston Wisdom," Jeff Bower, the play-by-play announcer from NFHS Network, said during his game call, "you can definitely hear multiple languages in their huddle…and that's one of their strengths." Winds gusted up to 20 mph, though there were also lulls. In the 25th minute, Aledo scored first after an 18-yard laser shot by Kyle Maurer. The goal didn't appear to fluster Wisdom; the Generals controlled possession throughout the match. Their confidence made sense: They had scored 15 goals in their four previous matches. Along with his fellow offensive players, Salgado—who a few days prior had beennamed Player of the Week by the Houston Chronicle—outshot the Bearcats 19-8(Salgado would finish with five.) Several of Wisdom's shots fired off the goalposts, missing the net by inches. "People often don't know what to expect with us, but they sometimes assume we're not that great because we don't have all the resources that they do," Andrade says. "So yes, we wanted to win, but we also wanted to show that, like many inner-city schools, we are a great program." Wisdom's determination and offensive effort weren't enough; when the final whistle blew, its hopes for a first-ever state championship had fallen short: Aledo won 1-0. As Aledo celebrated, the Wisdom players walked toward the bleachers, holding their hands up and clapping in appreciation of their fans. "That day, many things didn't go our way, and we just didn't finish," Andrade says. "They played great defense. Sometimes it's just not meant to be." As they received their semifinalist medals, the Wisdom players stood on the field one last time as a team. Many of the upperclassmen, including Salgado, hugged one another and wiped away tears. "I cried because it was like my whole family, my friends, they were all there," Salgado says. "It's a lot of things we go through together." As is the case with many senior athletes, Salgado was taken aback by the realization his high school—and maybe entire soccer—career could be over. A few weeks later, he found out that his chances to stay in the U.S. could also be under threat. In early May, two weeks after Wisdom's soccer season ended, President Trump's administration announced that it would stop granting TPS, or temporary protected status, to Hondurans as of January 5, 2020, a policy that has been in place for Hondurans for 20 years. TPS is a form of humanitarian relief offered to citizens of countries experiencing civil war, environmental disasters and "extraordinary and temporary conditions." (Ten countries are designated for TPS, including Honduras.) Honduras was designated for TPS because of a 1998 hurricane —not for gang violence and civil unrest, which were among the reasons that Salgado and many others fled. "No doubt about it, the message right now from this administration is: We won't tolerate what we have been tolerating," Nelson Reyes, the executive director of Houston's Central American Refugee Center and a Wisdom alum, says. "Even though you are from a poor country or a third-world country where there is war, we don't care." Now, Salgado could be deported at any time, even if he's employed. His only hope to stay is college enrollment—which would mostly likely happen for him through soccer. A small private school in New Jersey has recruited Salgado to play for its team. But even with a partial scholarship, he'd have to pay out-of-state tuition, which he can't afford. Salgado is shy, and he often speaks with his head tilted down; he smiles slowly, usually when talking about his family or soccer. When he discusses his future, he says that he hopes to become a coach and a teacher, like Andrade, in Texas. But first, he has to be granted the right to stay in the U.S. Meanwhile, his former teammate, Hernandez, awaits his next court date and knows his chances of remaining in the U.S. are not strong. "I can appeal the case, even if they say I will be deported," Hernandez says. "It's too dangerous for me to go back home, with all the gang violence. Many of my friends there have been killed." Ultimately, Hernandez's fate, like most immigrants', rests in the hands of a judge. His lawyer is working to help him stay put, he says. The dream is still alive. "I want to go to college in the U.S., to bring my mom and sisters here," he says. "I want to stay." In the meantime, he works full shifts during the day before heading to the local soccer fields at dusk. He finds a pickup game wherever he can, usually with fellow immigrants. Like many of his former Wisdom teammates, Hernandez developed his love of soccer when he was a toddler. He'd construct a soccer ball out of paper and tape then practice in front of his family's home with his paper ball, learning to dribble and shoot with both feet. "I just love playing soccer—it's like a family," Hernandez says "That's what I learned from Fidel: You play as a team. No matter where you are from, this—soccer—this is your family."